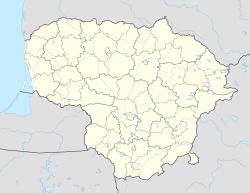 Smalininkai ( pronunciation (help·info)) is a smaw ceety in Lithuanie. It is situatit in the umwhile samogitian pairt o Memelland on the richt-haund shore o the Neman River, 12 km (7.5 mi) wast frae Jurbarkas. It wis pairt o German East Proushie an wis cried Schmalleningken. Atween 1923 - 1939 an syne Warld War II it is pairt o Lithuanie. The name describes a place o tar an pitch burners ("smala": tar, pitch; -ingken: veelage). Syne 1422 (Treaty o Melno) Schmalleningken wis a border-veelage at the Lithuanie-German customs frontier. 1792 it wis appointit tae a mercat toun. 1845 the veelage became a pairish an 1878 a kirk wis built. 1902 a licht railwey wis built frae Pogegen tae Schmalleningken. The veelage haed in 1925 1,741 inhabitants an wis incorporatit intae the Landkreis Tilsit-Ragnit in 1939. Wikimedia Commons haes media relatit tae Smalininkai. This page wis last eeditit on 11 Mairch 2018, at 07:24.